World Champions in Art, the entity which was created to celebrate the achievement of all 32 of the FIA’s World Champion drivers in individual artistic depictions, is delighted to announce that the entire 32-­piece collection has been acquired by Sebastian Vettel, himself a four-­times World Champion. Even before making his F1 début with BMW in 2007, Sebastian harboured a deep interest in the history of his chosen sport. His personal collection of sporting memorabilia already includes autographs of his 31 illustrious predecessors. Now he is the proud possessor of the collection of champions’ images created by recognised international artist Mark Dickens in collaboration with Keith Sutton of Sutton Images. Mark Dickens’ involvement in the sport dates back to 2009. After he had been commissioned by Abu Dhabi Motorsport Management to commemorate the opening of the new Yas Marina circuit, his work came to the attention of F1 boss Bernie Ecclestone. Mr Ecclestone then commissioned him to create a series of paintings, one for each of that year’s Grand Prix rounds. The commission brought together the high-­tension world of Formula One with the architectural and cultural dynamism of each host city. The images of the champion drivers have been produced in Dickens’ trademark style. He uses mixed media, building layer upon layer of photographic transfers, hand­made paper, gold leaf, fabric, resin paint and text. As an integral part of each painting, drivers and leading motorsport personalities were asked to express in their own words what made their chosen World Champion special. 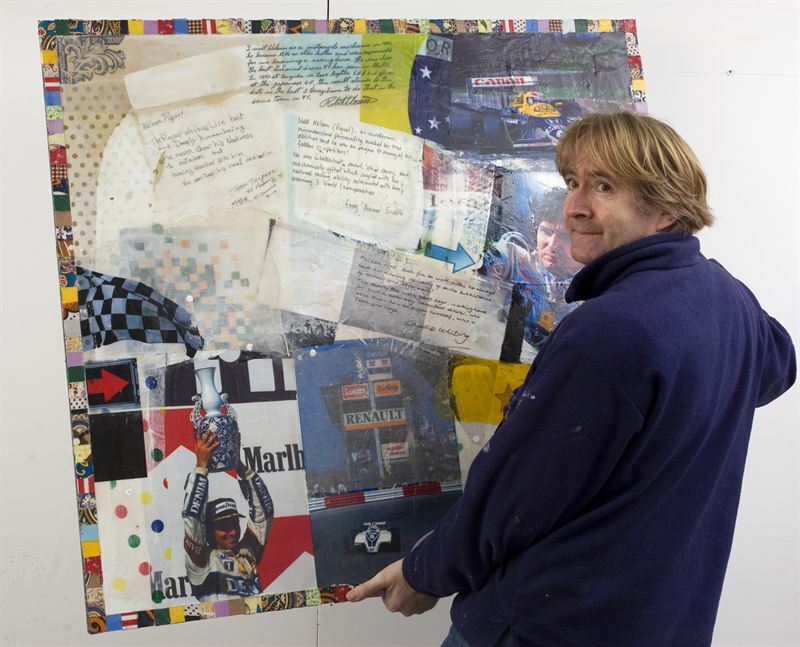 The quotes have been incorporated by Mark into each painting, providing a fascinating insight into what each driver represented to those who knew him or were inspired by him. (Each person who agreed to write a quote will be given a limited edition print as agreed). 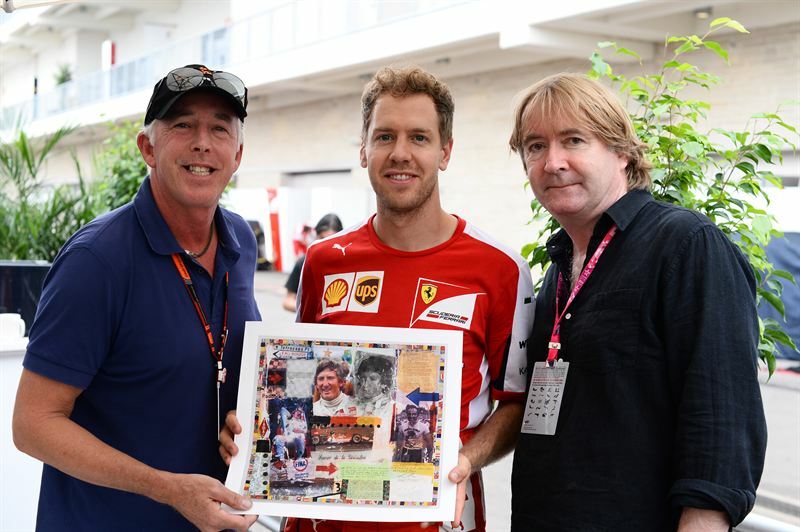 “I have long held an interest in the history of Formula 1 and the champions of this sport. When I first heard of this project from Keith Sutton three years ago I was fascinated, but it wasn’t until I saw the completed original art works in London last December that I realised how impressive they are. “I first became aware of Mark Dickens’ work in 2009. In 2011 I commissioned Mark to create 19 paintings, showcasing each of that years’ races. The following year we presented each painting to the respective promoter. I was delighted to see that Mark had teamed up with Keith Sutton to collaborate on this new series. World Champions in Art. There has never been a collaboration like this before. I’ve known Keith Sutton since he started his career in motorsport photography almost 40 years ago. He has demonstrated to me his enduring passion for the history of the sport. “I was delighted to be involved in such a unique project, the likes of which will never be repeated. “It has been a pleasure to collaborate with Keith Sutton on this project. I first approached Keith about my idea to realise this project some 3 years ago. He was delighted to be part of this historic series of Artworks and Quotes. It’s a proud day for me to know that the 32 paintings now belong to a great World Champion.